Clean the fish a few times with water and set aside. Heat oil in a pan and brown the onions slightly. Add in the ginger, garlic and tomato and fry for another minute. Stir in the coriander powder, cumin, turmeric, chili powder and salt with 2 to 3 tablespoons of water. Add the fish pieces and keep stirring gently. If the water dries up, add a few more tablespoons of water and continue stirring. 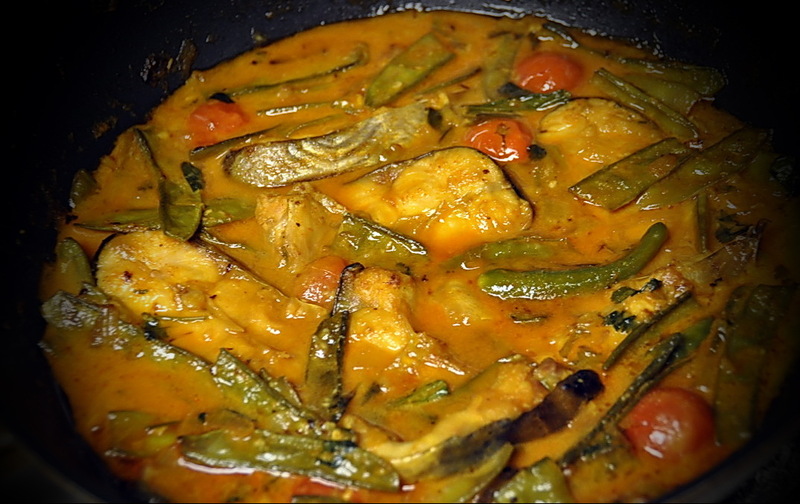 After 4 to 5 minutes, gently lift the fish pieces out of the pan and keep aside. Add the beans (sheem) into mix and stir for about a minute. Pour in 2 to 3 cups of water, cover and keep over high heat. Once the gravy starts boiling, turn down the heat to medium and remove cover. Add the fish back into the pan and let it simmer for a few minutes. Once the fish and beans become soft and tender, add in the green chili. Put the lid back on and cook for another 5 to 6 minutes. As the water starts to dry up, garnish with the coriander leaves and fried cumin powder. Stir and cook for another 3 to 4 minutes until the gravy thickens.